This new book is a compilation of information on wild horses, from postglacial until today, with chapters on the Tarpan, the Mongolian wild horse, the Sorraia, Konik, and Exmoor, domestication and dedomestication, wild horse colors, etc. Additional chapters on the Duelmener, Camargue, and mustang. There is no other book like this! 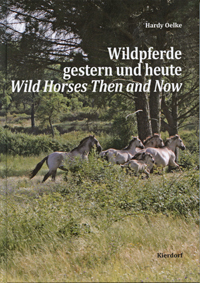 Dieses neue Buch ist eine Sammlung von Informationen über Wildpferde, von der Steinzeit bis heute. 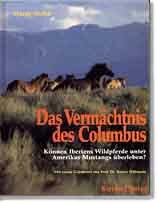 Kapitel über den Tarpan, das Mongolische Wildpferd, das Sorraia-Pferd, den Konik und das Exmoor Pony, über Domestikation und Dedomestikation, Wildpferdfarben usw. Zusätzliche Kapitel über Dülmener, Camarguais und Mustang. Es gibt kein zweites solches Werk! The must-have book on Sorraias, mustangs, and Sorraia Mustangs. 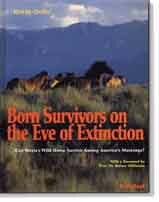 "One of the most important and especially responsible works published in recent years", says zoologist Prof. Dr. Willmann about this book, which brings to your attention one of the world's last primitive horses, the Sorraia, and the precarious situation its offshoot, the Sorraia-type mus-tang, is in. Wild Horses, feral horses, ancestral horses, the Sorraia horse, history of the American mustang, the Spanish mustang, the preservation of the Spanish mustang and the Sorraia, scientific proof for the authenticity of the Sorraia mustang – these are topices covered in this outstanding book, which deals with Przewalski's horse as well as with the Tarpan, with ancestral wild horse forms, with the "Barb myth", with the question of how Sorraias came to the New World, with how they could survive in the wild, and with the history of different mustang herds.